Left-handed starter Gio Gonzalez had a shaky start to Thursday night’s interleague game between his Washington Nationals and the Tampa Bay Rays. Gonzalez faced seven batters in the second, allowing the Rays to take an early 1-0 lead, but the Nats came back from behind for a 5-2 victory. Gonzalez had a lot of trouble, according to Manager Davey Johnson, due to “missing the plate” or at least that’s what home plate umpire Cory Blaser thought of his performance. He threw 98 pitches, 58 for strikes, over six innings and gave up seven hits, two runs, and two walks while striking out four and throwing one wild pitch. The minor setback was to no avail for Tampa Bay, though, because the Nats regained a temporary lead in the third inning before taking it all back in the sixth. Nationals starting pitcher Ross Detwiler went into Saturday night’s game with a 2.63 ERA and came out of it with a 3.65. Long story short – Detwiler didn’t have a good night against the first place Baltimore Orioles. 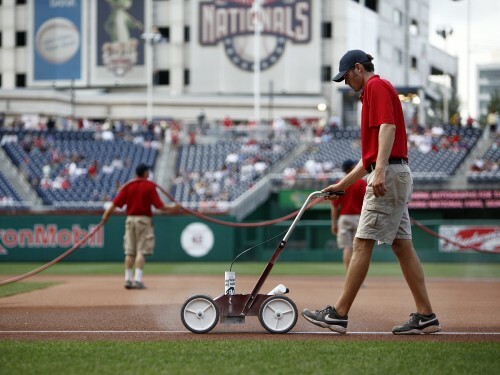 At least on Wednesday night, the Washington Nationals had the decency to make it interesting. Before losing 7-5 to the Florida Marlins and dropping further into the basement of the National League East, Washington managed to piece together four hits and a walk to score four runs in the bottom of the ninth. The last of those hits — a two-run single by Michael Morse — scored two runs and brought Laynce Nix, who had already hit a solo home run in the bottom of the fourth to make the score 3-1 Florida at the time. Nix came within a foot of tying the game, lifting a Leo Nunez change-up very high in the air and very far into left field. But the ball had been hit a little too close to the end of Nix’s bat, the ball settled into Mike Stanton’s glove instead of in the Nationals bullpen, and Washington had officially lost eight of their last eleven games dating back to the All-Star Break. In the long-term plans of the Washington Nationals, Jordan Zimmermann will be a No. 2 guy, a complementary left hook to the right-hand lead represented by a healthy Stephen Strasburg. 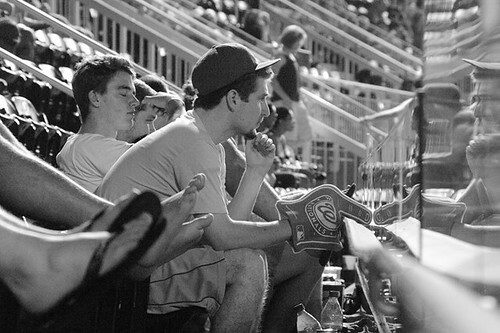 But with Strasburg on the shelf until at least September, Zimmermann became the de facto No. 1 starter entering the 2011 season despite the fact that he would be pitching under a 160-inning limit. 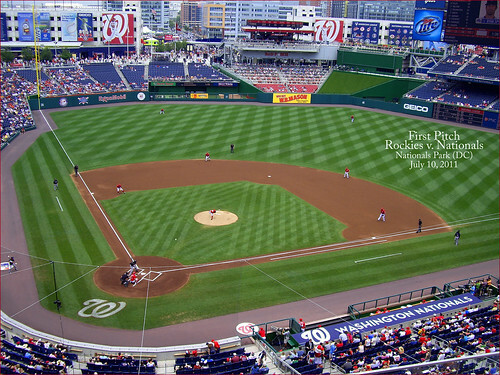 After a very strong 6.1-inning performance in Sunday afternoon’s 2-0 win over the Colorado Rockies, which sent the Nationals into the All-Star Break with a record of 46-46 and halted a particularly morale-sapping three-game losing streak, Zimmermann has pitched 115 of his allotted 160 innings. He extended his streak of pitching six innings or more in his starts to 13 and dropped his ERA from 2.82 to 2.66. He was, in short, exactly the man the Nats needed. His slider and curveball were particularly effective on this day, exploding down and away from Colorado’s right-handed hitters and, more often than not, finding the outside corner of home plate umpire Brian Knight’s strike zone. Zimmermann’s (and Washington’s) win didn’t come easily, as the Nationals offense continued to struggle. This time, it was Jhoulys Chacin who caused the trouble as he retired the first 11 Nationals he faced before giving up a two-out single to Ryan Zimmerman in the bottom of the fourth inning. That was Washington’s last hit before Ian Desmond led off the bottom of the sixth with a laser that deflected off the glove of third baseman Ian Stewart and reached shortstop Troy Tulowitzki far to late for Colorado’s All-Star to do anything about it. Zimmermann, proving himself doubly indispensible, laid down a beautiful sacrifice bunt and Roger Bernadina did the rest, driving in the only run the Nats would need with a shattered-bat single to right field. Rick Ankiel, who had entered the game in the eight inning as a defensive replacement, provided the icing in the bottom of that inning with a solo home run into the first row of the right field seats off left-hander Matt Reynolds. It was Ankiel’s first home run off a left-handed pitcher since 2008. Other members of the Nats were not so lucky. Jayson Werth, for one, went 0-for-3 at the plate to drop his average to .215 entering the All-Star Break. The big-money right fielder was greeted with applause by most of the 21,186 at Nationals Park when he was announced for his first at-bat in the bottom of the second inning. The fans held their collective tongues when Werth flied out to center field and left field in his first two at-bats (both times on first-pitch swings), but could restrain themselves no longer when he lifted a meager foul pop-up in the bottom of the seventh inning with Michael Morse standing on second base after a one-out double. 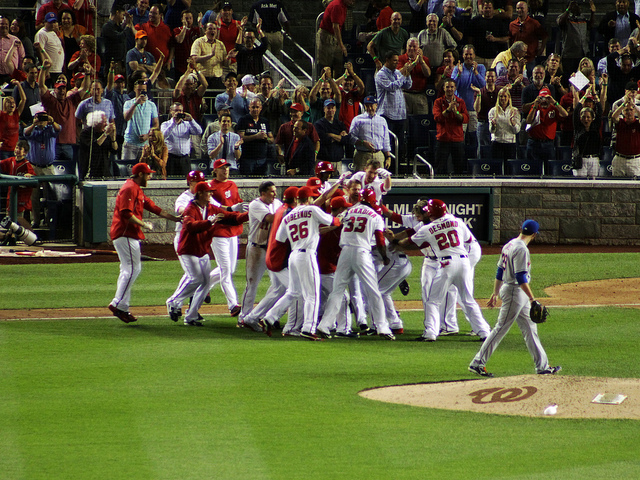 At that point, the boos hailed down on Werth all the way back to the dugout. As the season winds to its conclusion, and as the Nationals (likely) continue to drift around the fringes of the National League wild card race, Werth’s ongoing offensive struggles will continue to be the story, at least until he snaps out of it. But unlike on Saturday night, when Werth grounded into a game-ending double play with the tying run at third base, his struggles were only a footnote to Zimmermann’s great performance. It’s doubtful Werth will take any consolation from this as he prepares for his three days off, but at this point, he’ll take any consolation he can get. If Thursday night’s 10-9 loss to the Chicago Cubs was a spectacular defeat for the Washington Nationals, Friday night’s 3-2 loss to the Colorado Rockies was more in keeping with past defeats this season, complete with offensive incompetence and a pinch of bad luck. In this case, actually, the bad luck was a hammer blow in the form of a baseball off the bat of Ty Wigginton in the top of the fourth inning with Washington on top 1-0. John Lannan had started his outing crisply, and had made it through the first three innings without allowing a single baserunner. After Carlos Gonzalez struck out swinging at a two-seam fastball to lead off the fourth, however, things fell apart quickly for Lannan. Jonathan Herrera lined a four-seam fastball back up the middle for Colorado’s first hit (and base) of the night. Todd Helton pulled a two-seam fastball over the inner half of the plate into right field to put runners on first and second base. And then Wigginton lined another two-seamer straight at Lannan’s skull. Replays were inconclusive as to whether the ball deflected off Lannan’s glove. What was more definitive was the ball striking Lannan in roughly the place where nose and left cheek come together. As the ball continued into center field and Herrera raced home to tie the game at 1-1, Lannan staggered to his knees for a few seconds before picking himself up and walking to the clubhouse under his own power, holding his cap to his face to staunch any bleeding. The official diagnosis was a nose contusion, and there remains a possibility that Lannan could make his next scheduled start after the All-Star Game. Despite being allotted as much time as he needed to warm up, Ryan Mattheus seemed rattled by his early appearance in the game. He induced Mark Ellis to ground back to the mound, but double-clutched on the throw to second and only an apparently generous out call from Brian Knight gave the Nationals the second out of the inning. Mattheus was then called for a balk by home plate umpire Bob Davidson, which forced Helton home with the go-ahead run. That in turn was followed by an RBI single for rookie Cole Garner, which made the score 3-1 and was all the scoring Colorado would do or need. The rest of the night was, for the most part, an exercise in futility by the Nats offense, beginning in the first inning, when they loaded the bases with nobody out against Jason Hammel on a Roger Bernadina double, a walk to Danny Espinosa and an infield single by Ryan Zimmerman. Hammel kept it together, allowing only a sacrifice fly by Michael Morse (which scored Bernadina to give Washington their early lead) before striking out Jayson Werth and inducing Rick Ankiel to pop out to second base. In the rest of his outing, Hammel faced 20 batters, and allowed just four of them to reach base (a walk to Espinosa in the third inning, a solo home run by Wilson Ramos that made the score 3-2 to Colorado, a two-out single to right by Werth in the sixth, and a single to right by Desmond in the bottom of the seventh that precipitated Hammel’s removal). Hammel’s removal did not turn the tide in Washington’s favor. With newly-recalled Jesus Flores pinch-hitting in the seventh inning against Matt Reynolds, Desmond was picked off and caught trying to steal second. And the offensive ineptitude reached its climax in the 9th inning after a leadoff single by Morse. After Werth struck out flailing wildly at a pitch in the dirt, pinch-runner Brian Bixler, seeing the ball get away briefly from catcher Chris Iannetta decided to try to scamper over to second base. Iannetta recovered the ball in plenty of time to throw out Bixler, and Ankiel’s swinging strikeout ensured that the Nats would drop back to the .500 mark entering the final weekend of the season’s first half. Jayson Werth, the focus of so much agonized discussion among Washington Nationals fans over the last few weeks, didn’t get the big hit in this 4th of July thriller. But he did score the winning run, drove in two more, walked twice, and helped cut down a runner at the plate as the Nationals scrambled back to the .500 mark, defeating the Chicago Cubs 5-4 in 10 innings in front of most of an announced crowd of 32,937 at Nationals Park. Washington’s winning sequence was classic National League baseball. After Werth worked a walk off losing pitcher Marcos Mateo, he was bunted over to 2nd base by pinch-hitter Livan Hernandez. Hernandez was actually the second pitcher to pinch-hit in the game as Nationals manager Davey Johnson was forced to creatively manage his shortened bench in the absence of Michael Morse (hairline fracture of the forearm). After Mateo was forced to depart with an injury in favor of Carlos Marmol, Werth caught the Cubs infield defense napping and stole third without even drawing a throw. Finally, when Marmol’s 2-2 pitch slipped past Geovany Soto and bounced around the backstop, Werth raced home with the winning run. If you’re an outsider looking in then it’s easy to paint each resident of the greater D.C. metropolitan area with a political brush. People living in Maryland, Virginia or D.C. know the District is widely regarded as being the epicenter of the American political spectrum. In anticipation of Glen Beck’s “Restoring Honor” rally at the end of August, We Love DC author Ben H. Rome emphasized that Washington’s culture remains as diverse as its people. The interests of people who live here go beyond day jobs and politics. Living in D.C. is a catalyst for an active and intellectually stimulating lifestyle. Not only do the Washington Nationals know this, but they embrace it. 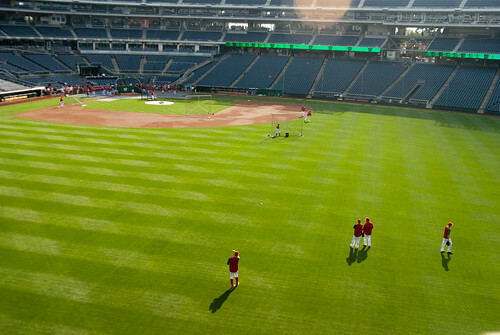 When they’re not at Nationals Park or on the road, Nationals players take advantage of their new home.